Schaedel Farm Quilt "Moravian Star"
The oldest Warren County deed recorded dates back to early 1813 with a deed showing that the property was owned by Hezekiah Drake and his wife. They had a son named James P. Drake who inherited the farm upon Hezekiah's death. James P. Drake died July 1914 and willed the property to his wife, Martha O. Drake and a son Andrew Y. Drake. Andrew Y. Drake (a bachelor) died May 2, 1956, leaving his half to his mother Martha O. Drake. On May 14, 1958, she sold the property to Kings Acres Inc. (owners William G. Schaedel and William K. Schaedel). Martha O. Drake died shortly after leaving a substantial amount of money to Hope Methodist Church. In a 1954, documentary titled "Our Changing Times" - produced by McGraw Hill was filmed in the house of the Drake Farm which is across the road from the wagon house. (It is rumored that Tom Planer made his theatrical debut in this film). Kings Acres divided the east side of the Lake Just-it Road into lots and sold them to various individuals. This included the original homestead. Kings Acres also took the wet land and built a pond next to the spring house which was restored and is dated 1927. 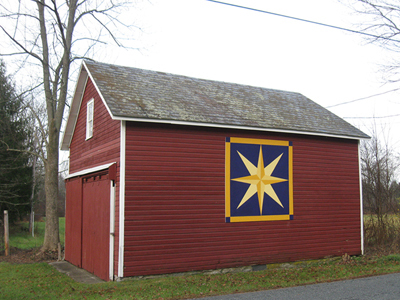 The quilt design is placed on the Drake Farm's original wagon house. The interior structure is still intact including many Drake Farm items. The original barn is in the back. It also has the original carriage, feed box, etc. The barn has been re-sided, but still has the original frame. William K. Schaedel received the property upon the liquidation of Kings Acres. He and his wife, Peggy built their firest home on the property on September 19, 1968. They call the farm "Shady Dell Farm II". Shady Dell Farm I was in Hackettstown. Through the years, they have maintained the farm with the help of local farmers. Recently they sold some of the acreage to the State of New Jersey in order to increase the size of Jenny Jump State Park. The balance of the acreage is in conservation with the right to build one house. It is a pleasure and honor to have a New Jersey barn quilt on our 1880 wagon house. The design was chosen because of the Moravian Village of Hope and First Hope Bank.